This article is about Greninja's appearance in Super Smash Bros. 4. For the character in other contexts, see Greninja. Greninja (ゲッコウガ, Gekkouga) is a playable character in Super Smash Bros. 4. It was revealed during the April 8th, 2014 Super Smash Bros. Direct, alongside fellow Pokémon representative Charizard. Greninja is voiced by Billy Bob Thompson in English and Yūji Ueda in Japanese. Like numerous other Pokémon, it has different voice actors in the French and German versions due to name changes, similarly to Jigglypuff. Greninja is currently ranked 26th out of 55 on the tier list, placing it in the C tier. Greninja's greatest strength is its overall mobility: its walking speed, dashing speed, air speed, jump and double jump are each among the top 10 within their respective categories. It also has an impressive combo game courtesy of a number of moves, most notably its up and down tilts, its neutral and up aerials, and its down throw, all of which are decently fast. Its recovery is also above average, with Shadow Sneak being able to cover a noticeable amount of horizontal distance, while Hydro Pump is decently fast and maneuverable like Quick Attack. Greninja also boasts a decent projectile in Water Shuriken and a variable counterattack in Substitute. Water Shuriken functions as both a decent approach tool and boasts KO potential when fully charged against highly damaged opponents, while Substitute possesses combo, recovery and mindgame potential due to its unique ability to be aimed in various angles during the counterattack. Lastly, Greninja has some of the best smash attacks in regard to overall utility, with its up smash being one of the strongest in the game. Despite these strengths, Greninja has a number of flaws. It has rather high ending lag on many of its attacks (with its aerials being notorious in this regard), requiring Greninja players to know when they can safely use such attacks. Greninja's recovery is also decent at best, as despite having a number of options, Hydro Pump and Shadow Sneak can both be predictable. Furthermore, while Greninja does boast a number of powerful KO moves, they are difficult to sweetspot due to their unusual hitbox placements, and some of them are slow and unsafe to use in a neutral situation. Overall, Greninja has a fairly high learning curve, but can become a potent character when mastered. As a result, it has average matchups with the rest of the cast with decent tournament results along with a few dedicated and noteworthy players, such as iStudying and Some. Fittingly for a ninja-inspired character, Greninja fits the "hit-and-run" archetype alongside the likes of Sonic, Sheik and Zero Suit Samus. This is clearly evident in regard to its mobility: it has the fourth fastest walking speed, the sixth fastest dashing speed, the eighth fastest air speed and the second highest jumps. It also possesses the ability to both wall jump and wall cling. Unlike said characters, however, Greninja's KO power is more consistent overall, which is evident in its up smash, forward aerial and up throw, all of which are powerful relative to SSB4's cast. As such, Greninja can be considered a good mix of speed and power. Complementing Greninja's fast mobility is a set of relatively fast attacks and a strong combo game, most notably with its jab; when cancelled, it is one of Greninja's best combo starters, being able to set up a forward tilt, down tilt, neutral aerial, or a grab. All of Greninja's ground attacks additionally have no more than 15 frames of startup (barring its down smash, which is active at frame 16), which makes it easy for it to land attacks, while a few of its moves such as its up tilt, down tilt, neutral aerial, back aerial (first two hits only), down aerial (late hit), up throw, and down throw, work effectively for starting combos. Altogether, these traits grant Greninja arguably one of the best neutral games and damage racking abilities out of all middleweight characters. Greninja, despite being a fast faller, also has a strong recovery, as Hydro Pump covers a very long distance, and can be angled, while its side special Shadow Sneak allows it to teleport a long distance without entering helplessness. Though only situational at best, its counter move and down special Substitute can be used to recover if the control stick is held upward; however, due to its long duration if the move fails, it is best advised to use it if used on a slow attack. Greninja also has above average air acceleration and air friction, which when combined with its already superb air speed and high jumps also gives it a strong air game. Greninja's air game also extends into the utility of its aerial attacks, with its neutral aerial being a good combo starter and high-percentage finisher. Its forward aerial, despite its awkwardly slow startup for a fast character, is relatively strong as previously mentioned, and begins to KO starting at 105% at the edge. Its back aerial is very fast (coming out on frame 5), its up aerial can drag opponents offstage during a fastfall, and its down aerial is a stall-then-fall meteor smash that can meteor smash with its clean hit or start combos with its late hit. To further add to its already strong air game, none of its aerial attacks have more than 17 frames of landing lag (except for down aerial, at 33 frames). Finally, Greninja has a versatile set of special moves at its disposal. Water Shuriken is a relatively powerful projectile, gaining KO potential usually starting at 115% if fully charged. However, unlike most other projectiles, it has actual combo potential due to a fully charged Water Shuriken being able to trap opponents, while Greninja can potentially rush them down and follow up with a neutral, forward or up aerial or even an up smash. Even then, a quickly uncharged Water Shuriken can allow Greninja to recover fast enough to punish with options such as a dash grab. Aside from recovery/edgeguarding applications, Shadow Sneak can be used to dodge an attack and act as a pseudo-counterattack if timed properly, and is an invaluable mindgame tool regardless, though it leaves Greninja with a limited number of actions. Hydro Pump can be used to escape pressure from opponents by pushing them away, or even be used to gimp. Finally, Substitute is the only counterattack in the game that can be aimed should it succeed, which allows Greninja to set up a deadly combo (usually into up aerial) for a quick KO, or even recover as stated previously. However, Greninja suffers from two major flaws that are enough to offset its strengths. The first and more noticeable of the two is the disproportionate amount of ending lag on a few of its attacks, most notoriously with its aerials: neutral aerial and down aerial (and, to an extent, forward aerial) have high enough ending lag to cause an accidental self-destruct if used immediately after dropping from the sides of a stage, especially when considering Greninja's falling speed. Its smash attacks and special moves are also rather heavy with ending lag, making them easy to punish on shield (though it is also worth noting that its neutral and forward aerials are relatively safe on shield, making them slightly more reliable than the aforementioned moves). This makes it easy for even slow attacks to start a combo on Greninja, as none of Greninja's aerial attacks are good at interrupting combos due to slow startup or a lack of lingering hitboxes. In addition, Greninja relies heavily on landing with aerials, and is thus especially prone to being anti-aired or whiff punished on landing. Greninja cannot safely put out rising aerials because none of them autocancel in a short hop. While its down aerial and Shadow Sneak can have decent combo breaking ability, they are both risky to use due to their slow startup and high ending lag. Although Greninja has a number of powerful finishers, they are usually hard to land from from a neutral standpoint due to hitbox placements or slow start-up. This even applies to its counterattack, as Substitute does not grant intangibility (unlike other counters), which puts Greninja at risk even while returning an attack. In addition, while Greninja has the longest-ranged non-tether grabs, a fast dash grab (being active on frame 9), and one of the best up throws in SSB4 due to its low percent combo potential and KO potential at high percents, the consistency of its grab game is only average at best due to its standing and pivot grabs being relatively slow (being active on frames 11 and 15, respectively) and having one of the worst pummels in the game, while its back throw is its only throw that deals passable damage. Surprisingly for a fast character, Greninja's speed does not necessarily translate to it having a flexible combo game, which forces it to rely on its grabs and tilts to perform combos (with the former being slow and the latter being hard to land aside from down tilt), while some of its most complicated combos, such as those which rely on the auto-link angle of its up and back aerials, require extensive knowledge to perform correctly. Lastly, even though Greninja has an effective air game, it is still flawed in a number of manners. The previously mentioned ending lag on all of Greninja's aerial attacks makes them risky to use offstage unless Greninja can still make use of its double jump and/or wall cling ability. Its neutral aerial is hampered by its short range, its forward aerial has slow startup, its up aerial has almost no range next to or below it, its back aerial is one of the weakest in the game, and its down aerial is risky to use offstage due to its ending lag and Greninja's fast falling speed. Greninja's custom moves are rather polarizing, as the majority of them are inferior to their regular versions, while only very few are very useful. One example of this involves its versions of Water Shuriken. Stagnant Shuriken is a very poor alternative due to it only staying in front of Greninja. However, Shifting Shuriken is extremely useful in that while it slightly detracts from Greninja's already poor range, it addresses its combo game's issues: when uncharged, it launches opponents straight up, and when charged, launches opponents toward Greninja. Shadow Dash is an instant warp that can give Greninja a more viable recovery option, but travels a fixed distance, removing Greninja's best mindgame tool. Shadow Strike has more power and covers more distance, but the shadow moves much slower, rendering it useless for both recovery and efficient mindgames. High-Capacity Pump, on the other hand, is very useful, as it covers far more distance and is much easier to control, while only being slightly slower. This greatly improves Greninja's already fearsome recovery. Single-Shot Pump is significantly inferior to Hydro Pump due to it being very linear and lacking any edgeguarding potential due to it only propelling Greninja straight up. Although Substitute Ambush may make it even easier to intercept, it gives the player more time to pick a direction and also does high shield damage. However, Exploding Attack is a superior option to both due to being more practical, powerful, and easier to hit with, though sacrificing the range and recovery potential. Overall, Greninja is a quick-footed yet somewhat unorthodox combo-oriented fighter, balancing respectable combo ability with stronger yet more punishable KO potential. True to its name, mastering Greninja requires the art of deception through mastering its unique special moves along with knowledge of its unusual combo and KO setups, while minimizing openings due to the ending lag of its attacks and sluggish grab game. While Greninja's learning curve only gives it an average amount of representation, players such as iStudying have spearheaded its metagame and shown Greninja's strengths in competitive play. Greninja has received a mix of buffs and nerfs from game updates. Update 1.0.4 notably nerfed Greninja by lowering the knockback on a handful of its amoves, and removing the Shadow Sneak glitch that allowed it to cancel the landing lag of its aerials. The most significantly nerfed move, however, was its up smash; initially one of the best anti-airs and smash attacks in the game, by virtue of its huge range and fast interruptibility allowing it to more easily beat out aerials and juggle opponents while even comboing into Greninja's own aerials, its ending lag and hitbox sizes were significantly increased and decreased respectively, so it is much harder for Greninja to take full advantage of the move. Greninja's hurtbox size at the top of its head was also increased in 1.0.4, making it easier to hit and rendering its once-decent crouch nearly useless. However, these nerfs were slightly compensated for as Shadow Sneak was buffed to a degree. Like 1.0.4, 1.0.5 removed another exploitable glitch, the running Shadow Sneak glitch. However, Greninja has also seen some improvements in later updates. 1.0.8 noticeably improved its forward tilt's utility for spacing. Update 1.1.0 gave Greninja a mix of buffs and nerfs, though the former was more prevalent than the latter. While its down throw's damage output was decreased and Water Shuriken no longer stalls Greninja in the air after a jump, its down throw's ending lag was reduced, while Water Shuriken's startup was decreased, allowing it to camp more effectively. In addition to its ending lag, down throw's damage decrease indirectly improved its combo potential; one notable combo is into forward aerial for a potential KO at high percentages, although it is nevertheless dependent on DI. Update 1.1.1 only changed Greninja's Shadow Dash custom, decreasing its ending lag. The changes to the shield mechanics brought about by updates 1.1.0 and 1.1.1 were overall beneficial for Greninja: although its poor out of shield game was further weakened, several of its attacks have increased hitlag multipliers (such as the last hits of its jab, back aerial, up aerial and fully charged Water Shuriken, as well as its forward and down aerials) and are therefore safer on shield; particularly, forward aerial has become a much more useful move thanks to its safety on shield while providing relatively lenient spacing, and its neutral aerial also benefits due to its average damage and low landing lag. Update 1.1.3 slightly buffed the knockback to Greninja's smash attacks and all variations of Shadow Sneak, which helps compensate for 1.0.4's weakening of its KO potential. Lastly, update 1.1.5 decreased dash attack's and standing grab's startup lag, and its forward and back aerials' landing lag. It also considerably improved Hydro Pump's reliability by tweaking its angle to avoid it from "headbonking". The period Greninja can be at its maximum fall speed before using hard landing lag has been lengthened: 6 → 7 frames. Up smash has increased ending lag: frame 42 → 52, significantly reducing its combo potential and making it easier to punish. Up smash's first hit's radius decreased: 6.5 → 5. Clean up smash's second hit's center radius decreased: 7 → 6. Clean up smash's second hit deals 2% less damage: 13% → 11%. Clean up smash's second hit's bigger hitboxes Y-offsets decreased: -5 → -4. Late up smash's second hit deals 1% less damage: 11% → 10%. Down smash deals 2% more damage: 11% (katanas), 9% (arms) → 13% (katanas), 11% (arms). Down smash's knockback growth decreased: 93 → 90. Forward aerial's knockback growth decreased: 92 → 84. Up aerial's hits have been restructured: hits 1-5, hit 6 → hits 1-4, hit 5, hit 6. Its timing and overall damage output remain the same. Up aerial's fifth hit's angle altered: 366° → 85°. Up aerial's fifth hit's fixed knockback value increased: 0 → 10. Up aerial's fifth hit's radius increased: 5.5 → 6.2. Up aerial's sixth hit's knockback growth decreased: 190 → 168. Up aerial's sixth hit's radii increased: 6, 7 → 6.2, 7. Shadow Sneak and Shadow Strike's knockback growth increased: 100 → 102 (normal), 100 → 101 (reverse). Shadow Sneak's ending lag decreased. Shadow Sneak's shadow travels faster. Fixed a glitch where Greninja could cancel its landing lag with Shadow Sneak. Hydro Pump's base knockback decreased: 85 → 65. Hydro Pump's knockback growth decreased: 130 → 100. High-Capacity Pump's fixed knockback value decreased: 100 → 90. Fixed a glitch where Greninja could dash before using Shadow Sneak. This hinders its approach and mindgame potential. Forward tilt deals 0.8% more damage: 6.5% → 7.3% and has decreased ending lag: FAF 42 → 33, improving its spacing potential. Down throw deals 1% less damage: 6% → 5%. Down throw has decreased ending lag: FAF 50 → 43, and altered knockback: 65 base/50 growth → 53 base/75 scaling. Alongside the decreased damage, this grants it combo potential especially at low-mid percents. Water Shuriken's startup lag decreased: frame 25 → 20. Fixed a glitch where Water Shuriken stalled Greninja in midair after a jump. This removes its recovery potential. Shadow Dash's ending lag decreased. Second victory pose slightly changed. Forward smash's knockback growth increased: 99 → 101. Sweetspotted up smash's second hit's knockback growth increased: 103 → 104. Down smash's knockback growth increased: 90 → 92. All variations of Shadow Sneak have had their knockback growth increased: 102 → 104 (front Shadow Sneak/Shadow Strike), 101 → 103 (back Shadow Sneak/Shadow Strike), 90 → 92 (front/back Shadow Dash). Standing grab has 3 frames less of startup: 14 frames → 11. Dash attack hits 2 frames earlier: 9 frames → 7. Dash attack ending lag reduced by 2 frames: 32 frames → 30. Hydro Pump's Bonk: Headbonk angle changed (survival-ability improved). Greninja is able to crawl, wall cling and wall jump. 2% Two alternating palm thrusts followed by a double palm thrust that emits a small blast of water. If button mashed, it is instead followed by a series of knifehand strikes that emit blade-shaped blasts of water that concludes with an outward knifehand strike that emits a small blast of water. It can also be jab canceled, such as into forward tilt, down tilt and forward smash. 7.25% A hook kick. Can be angled, and is able to lock opponents. 4.5% Crouches forward and bobs its head to strike with its tongue. A good set-up for aerial combos, such as neutral, up and back aerials. 7% A crouching Hapkido-style shin kick. Slightly launches the opponent into the air, which can be followed by forward tilt, forward smash or down smash at low percents or a short hopped forward aerial at high percents. 7% A legsweep. Very weak knockback but sends at a favorable angle for followups. It can combo reliably into forward aerial at medium percents. 14% A reverse gripped inward slash while wielding a katana made of water. It can be pivot canceled. Good range and strong for its speed, KOing Mario on the middle of Final Destination at 123%, though it has punishable ending lag. 5% (hit 1), 14% (hit 2 clean center), 11% (hit 2 clean sides), 10% (hit 2 late) Two reverse gripped outward arcing slashes while wielding two katanas made of water. The move consists of two hits: a double stab upwards followed by an outward rip. Its sweetspot is the initial upward stab, which chains directly into the second hit and has very high power, KOing at around 98% and is Greninja's strongest finisher. Meanwhile, the outward slashes are easier to connect with due to their range but are much weaker, KOing at 125% at the edge. The sweetspot is useful for aerial protection or covering ledge jump options, and the outward rip can be used in the same fashion as a down smash. 13% (katanas), 11% (arms) Two reverse gripped outward fanning slashes while wielding two katanas made of water. Hits on both sides and is a relatively strong semi-spike that can KO at around 118% at the edge, though it has some startup and ending lag. 11% (clean), 6% (late) Strikes a ninjutsu pose while it emitting an exploding water bubble around itself. The bubble itself is the attack's hitbox, despite it appearing larger due to the "water splash" around it. Can combo into tilts or a grab at low percents, or a forward/back aerial at mid percents. Its extremely generous auto-cancel window allows it to cancel from a full hop and even a double jump, but it has unusually high ending lag in the air, preventing Greninja from doing anything until landing, even from a double jump. 14% A reverse gripped slash while wielding a katana made of water, essentially being a midair version of its forward smash. Has some startup, but it is strong and viable for both KOing and edgeguarding. Auto-cancels from a full hop, but suffers from disproportionately high ending lag, much like Greninja's neutral air (though not to the same extent). 3% (hit 1), 2.5% (hit 2), 4% (hit 3) A series of back kicks, beginning at a high angle, then a low angle and ending at a mid-level. Greninja's fastest aerial, making it very useful for aerial combos and can even chain into itself. Like up aerial, the first two hits use the auto-link angle, allowing it to start unique combos (though this is comparatively difficult to do). The first two hits can also lock prone opponents on platforms by fast-falling through them. Auto-cancels from a full-hop fast-fall. 1.3% (hits 1-5), 3% (hit 6) A corkscrew flying kick. It is similar to Sheik and Samus', but differs in that Greninja attacks directly upward, instead of diagonally upward. An excellent combo tool and a useful KO option at high percents, especially when considering Greninja's high jump height. Since it launches opponents at the auto-link angle, it can be used to drag opponents down to the ground for a combo. Auto-cancels from a full-hop fast-fall. 8% A diving double foot stomp. It is a stall-then-fall and bounces off opponents, as well as most of the projectiles in the game, although the bounce deprives Greninja of its double jump. A clean hit meteor smashes opponents powerfully. Inadvisable to spam due to its high landing lag and ease of causing a self-destruct over the edge. Despite the risk involved, it is actually a good combo starter, with a meteor smash onstage being able to lead into aerials at high percents depending on DI, or even another down air. Similar combos can be done with the late hit at earlier percentages. — Grabs the opponent with a whirlpool. Farthest reaching non-tether grabs in the game. Surprisingly, however, Greninja's standing and pivot grabs are the slowest non-tether grabs in the game, being active on frames 11 and 15, respectively. However, Greninja's dash grab is relatively faster, as it is active on frame 9. 2% Squeezes the opponent with the whirlpool. It is one of the worst pummels in the game due to being moderately slow and having an average damage output. 5% Shoves the opponent forward. 8% Leans forward and then flings the opponent backward. 5% Heaves the opponent upward. Possibly Greninja's most useful throw, as it can be followed up with up smash at low percents, up aerial at medium percents and can KO around 150%-200%, the latter of which depends on the opponent's DI and weight. 6% Slams opponents onto the ground in front of itself. It can be followed reliably with forward tilt, forward smash or Shadow Sneak at low percents, or a full hopped forward aerial at high percents. 7% Sweep kicks around itself while getting up. 5% Sweep kicks around itself while getting up. 7% Performs a roundhouse kick while climbing up. Default Water Shuriken 3%-11% (uncharged), 0.7% (fully charged loop), 9% (fully charged last) Throws a shuriken made of water. It is chargeable, but its charge cannot be held indefinitely. Additionally, charging the move noticeably increases its power, but reduces its speed and range. When fully charged, the shuriken hits multiple times, ending with a final hit that has KO potential at the edge. The first use in midair lifts Greninja into the air very slightly. Custom 1 Stagnant Shuriken 1%-1.2% (uncharged loop), 1.5% (fully charged loop 1), 2% (fully charged loop 2), 3% (fully charged last) The shuriken stays in place, but deals less damage at varying charges. Custom 2 Shifting Shuriken 3% Uncharged shurikens deal strong upward knockback, while charged ones pierce opponents. Damage stays the same regardless of charge. Default Shadow Sneak 10% (normal), 12% (reverse) Silently prepares to teleport to a moving shadow, which activates when either attack button is released. The shadow moves relative to Greninja's position, and while it is being prepared, Greninja cannot run, shield, grab or attack, but can walk, jump and taunt. If the shadow is in front of the opponent, Greninja performs a handstand-initiated backflip kick. If the shadow is behind the opponent, Greninja dropkicks them instead. The latter strike is slightly stronger than the former, making it a deceptively strong finishing move, especially if used off-stage. Can be used to extend Greninja's recovery as it does not cause helplessness. If used with the correct timing, Greninja can escape some multi-hitting moves, but the ending lag will leave it in a vulnerable state. Custom 1 Shadow Strike 15% (normal), 17% (reverse) The shadow moves slower and farther while the attack is much stronger. Additionally, Greninja takes longer to reappear. Custom 2 Shadow Dash 6% (normal), 7% (reverse) Teleports a fixed distance instantly, though it is weaker than normal. Default Hydro Pump 2% (per shot) Shoots two streams of water from one of its hands in the opposite direction of travel, propelling Greninja in the input directions. Functions similarly to Quick Attack, though it can be used twice in the same direction. Each water stream has a push effect, allowing it to be used as an unorthodox edgeguarding technique; on the ground, Greninja can also fire a single spurt of water in one direction and then cancel it by aiming downward. While it offers excellent distance, Greninja will immediately start falling once the second water stream ends, making it easy to underestimate vertical distance gained. Unlike other up specials, Greninja's up special input will trigger a Shadow Sneak charge instead if the Control Stick is angled to the side enough. Custom 1 High-Capacity Pump — The water streams are more controllable, but deal no damage. Custom 2 Single-Shot Pump 5% Only one water stream is fired, though it is slightly more powerful. Default Substitute 14%/13%/11%/13%/14% (based on position) Assumes a defensive stance. If attacked, Greninja disappears and counterattacks while leaving a plush doll or a log in its place before counterattacking with a flying kick upon reappearing. The kick's direction can be inputted while Greninja has vanished, which can result mindgames due to the kick being able to function as a vertical KOing option, a semi-spike or even a meteor smash. It is unique as a counterattack due to its fixed damage, along with Greninja being vulnerable during the retaliating hit, allowing multi-hit moves to interrupt the counterattack. Custom 1 Exploding Attack 10% (close), 8% (far) Vanishes and reappears with an explosion around itself instead of counterattacking. Custom 2 Substitute Ambush 18%/17%/15%/17%/18% (based on position) Disappears for a longer amount of time, but performs a stronger counterattack upon reappearing. Secret Ninja Attack 2% (snag), 5% (flip), 2% (hits 1-15), 15% (hit 16) Launches opponents into the air with Mat Block, its former signature move in the Pokémon games. It then proceeds to slash them several times in midair while a moonlit backdrop appears, and then finally spikes them down to the stage with a downward knifehand strike. Emerges from a Poké Ball, then performs a ninjutsu hand sign that emits a small burst of water from its hands. Up taunt: Strikes a pose, then rises slightly more upright to strike a ninjutsu pose. Side taunt: Shakes head from side to side, causing its tongue to whip out in the same directions as saliva flies off. Down taunt: Poses upright and holds out arms to either side, releasing fountains of water from its palms. The water fountains deal 1%-2% with vertical knockback to nearby opponents. It can even KO, though only at extremely high percents (in the 400%-600% range for most characters). However, it is the only attack it can still use during Shadow Sneak. It is surprisingly effective in Multi-Man Smash. Crosses arms over its body, then separates them with a flourish. Hunches over and assumes a ninjutsu stance. An orchestral excerpt of the title theme from Pokémon Red, Blue and Green Versions, which has since become the main theme of the Pokémon series. Performs Double Team to briefly create three afterimages of itself. Performs a few ninjutsu hand signs that emit small bursts of water and then strikes a ninjutsu pose similar to its up taunt. Performs a flip and then crosses its arms after landing. It resembles one of its attack animations in Pokémon X and Y.
BT-Mac - The best active Midwest Greninja player. Best known for taking a game from Salem in the Greninja ditto at Midwest Mayhem 10. Has sets over players such as Mystearica and Marshall. DarkAura - The best Greninja player in Canada and one of the best in the world. Ranked 3rd on the Montreal Smash 4 Power Rankings, placed 5th at Canada Cup 2016. Donquavious - One of the best Greninja players in the United States. Placed 25th at 2GGC: Greninja Saga and Super Smash Con 2018.Has wins over players such as Fatality, Darkshad, and Sho. Eddy - The best Greninja player in Germany. Ranked 15th on the German Smash 4 Power Rankings, placed 25th at B.E.A.S.T 6 and 17th at Syndicate 2016. Elexiao - The best Greninja player in France and one of the best in the world. Currently ranked 1st on the French Smash 4 Power Rankings. IceArrow - The best Greninja player in New England. Ranked 5th on the Massachusetts Smash 4 Power Rankings. Illusion - One of the best Greninja players in Texas. Ranked 2nd on the San Antonio Power Rankings. iStudying - Overall the best Greninja player in Europe and one of the best in the world. Placed 2nd at B.E.A.S.T 6, 3rd at Syndicate 2016 and 3rd at Eclipse 2. Jw - Ranked 7th on the Ontario Power Rankings, wins on Fwed, Lima, Blacktwins, Mistake, Thunder. Lea - The best Greninja player in the world. The highest placing Greninja at 2GGC: Greninja Saga, placing 13th. He is a pioneer on Greninja's footstool combos. Ranked 32nd on the JAPAN Power Rankings. Has wins over players such as KEN, VoiD, Kameme, ANTi, and Tsu. NinjaLink - Uses a wide variety of characters in tournament, Greninja being one of them. He is a pioneer on the character's playstyle fundamentals. Known for being a "sensei" to other top Greninja players. Oisiitofu - One of the best Greninja players in Japan. Ranked 75th on the JAPAN Power Rankings. P2P with Gibus - One of the best Greninja players in Texas. Ranked 7th on the Dallas-Fort Worth Smash 4 Power Rankings, placed 7th at Low Tier City 4. Rattsu - One of the best Greninja players in Japan. Ranked 73rd on the JAPAN Power Rankings. Has wins over Takera, ikep and RAIN. Shiki - One of the best Greninja players in Japan. Has wins over Kisha, huto, Pichi and Songn. Ranked 157th on the JAPAN Power Rankings. Some - One of the best Greninja players in Japan. Ranked 49th on the JAPAN Power Rankings. Placed 9th at Frostbite 2017, the highest placement of any Greninja at a US National Tournament after the release of patch 1.1.6. Has wins over Captain Zack, Kameme, Fatality, Abadango, and KEN. Stroder - The best Greninja player in North America and one of the best in the world. Ranked 3rd on the Arizona Smash 4 Power Rankings, placed 13th at 2GGC: West Side Saga (where he defeated Nairo) and 33rd at 2GGT: Abadango Saga. Sukekokko - One of the best Greninja players in Japan. Has wins over Rizeasu, Towa, FILIP, Zaki and OCEAN. Ranked 52nd on the JAPAN Power Rankings. Venia - One of the best Greninja players in the United States. Ranked 4th on the New York Smash 4 Power Rankings. Has wins over Nairo. Waveguider - The best Greninja player in Australia. Ranked 1st on the ACT Smash 4 Power Rankings. aMSa - Placed 9th at Apex 2015, 33rd at EVO 2015, and 65th at EVO 2017. Retired following EVO Japan 2018. Continues to play Melee. Techei - Formerly ranked 16th on the MD/VA Smash 4 Power Rankings, placed 33rd at Glitch 2. Salem - Won Tipped Off 12 exclusively using Greninja, taking sets from Mew2King and Fatality. Also has close set with Mistake. Shinjoebi - The best Greninja in the Midwest, and is currently not active. Upon the game's release, Greninja was played extensively in Japanese tournaments. However, it would soon infamously receive nerfs in update 1.0.4, hurting its KO options, hurtbox, and also fixing a glitch that it had with Shadow Sneak. This, along with better characters up and coming, lowered Greninja's representation in tournaments, and it was beginning to be looked down upon due to its slow aerials, lackluster grab game, and lack of reliable KO options, and was passed over for characters perceived to be more viable. This and its high learning curve made it very distasteful to pick up. Despite this, Greninja still saw solid placings all around at tournaments, which caused its perception to not be as tough as it was after its nerfs. Greninja would at first rank at 25th on the first tier list released by the 4BR. 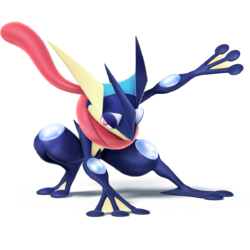 However, updates 1.1.3 and 1.1.5 gave Greninja noteworthy buffs, with an increase to its KO power and combo options, as well as reduced landing lag on some of its aerial moves. With these buffs, Greninja began to see higher representation and some players began to realize its potential once again, largely due to the work of DarkAura, Eddy, Oisiitofu, Some, Venia, and most notably iStudying, who achieved 2nd place at B.E.A.S.T 6. These results allowed it to rise to 21st on the second tier list. Despite its slightly rare results, Greninja was ranked 22nd on the third tier list, and is seen to be a viable option in tournaments, while also being backed by excellent tournament representation. After Some placed 9th at Frostbite 2017, however, Greninja's results dropped once again. Greninja was once again thought to not be as great as initially, esecially after 2GGC: Greninja Saga saw it placing rather inconsistently (this is largely attributed to the Greninja players eliminating themselves during the top 48 part of the bracket). Despite an explosion of Greninja's results appearing recently in tournaments, voting for its tier placement was already done, resulting on Greninja being ranked at 26th on the fourth and current tier list, its lowest placement so far. Regardless, it is generally agreed that this burst of good tournament results could cause Greninja's placement on a future tier list to rise, although this remains to be seen. This Water- and Dark-type Pokémon is the fully evolved form of Froakie. It is just as fast and dangerous as its name suggests, and the throwing stars it can make out of water can shear metal. In this game, as well as being a graceful, speedy fighter, it can also use moves like Hydro Pump to let it move through the air and avoid falling. Greninja's Substitute down special lets you teleport to dodge attacks and then strike back, making it an effective and hard-to-predict way to counterattack. You can also control where you reappear by inputting directions. When you vanish, sometimes you'll be replaced by a log, other times by a cuddly toy. Greninja's Substitute down special lets you teleport to dodge attacks and then strike back, making it an effective and hard-to-predict way to counter-attack. You can also control where you reappear. When you vanish, sometimes you'll be replaced by a log, and other times by a Substitute doll. In Greninja's Final Smash, it uses its Mat Block move to flip opponents into the air. It then slices them repeatedly in front of the bright moon before smacking them back down to the ground and launching them. The initial Mat Block flip doesn't have much range, but should it hit home, the rest of the attack is unavoidable. In Greninja's Final Smash, it uses its Mat Block move to flip an opponent into the air. It then slices them repeatedly in front of the shining moon, before smacking them down to the ground so hard they get launched. The initial Mat Block flip doesn't have much range, but if it hits home, there's no evading the rest of the attack. Fire-Type Frenzy: As Charizard, the player must defeat Greninja, Pikachu and Lucario. New Challengers 2: Greninja is one of the seven opponents fought in this event alongside Palutena, Robin, Shulk, Dark Pit, Mega Man, and Pac-Man. Pokémon Battle: Greninja must defeat Pikachu, Charizard, and Lucario. Pokémon Multi Battle! : Greninja is one of the player's Pokémon to use, as well as being one of the opponents. Artwork of Greninja used on the website. In Super Smash Bros. for Nintendo 3DS. In Super Smash Bros. for Wii U. Using Water Shuriken on Charizard. Using Shadow Sneak on Charizard. Using Substitute on Toon Link. Using Hydro Pump on Pikachu. Using its dash attack on Charizard. Using its up tilt on Mega Man. Taunting alongside Olimar and Diddy Kong. Laying supine alongside Wii Fit Trainer. Taunting alongside Lucario, Charizard and Pikachu. Greninja and Mario sporting their second alternate costumes. Prior to the addition of Corrin via DLC, Greninja was the most recent playable character in Smash 4, with Pokémon X & Y predating SSB4's release by eleven months. From December 9, 2014 to January 29, 2015, Japanese players of Pokémon Omega Ruby and Alpha Sapphire were able to gain a serial code to download a Greninja based on this Greninja, complete with a moveset consisting of SSB4 Greninja's special moves; an Original Trainer listed as スマブラ (SmaBra); and the Hidden Ability Protean. Interestingly, the event Greninja is always male, which suggests that the SSB4 Greninja is as well. Despite this, it is not listed under a specific gender per Nintendo and its affiliates' stance on, for the most part, using gender-neutral pronouns for all Pokémon, regardless of a species' appearance/gender ratio or lack thereof. Prior to the release of Pokémon Omega Ruby and Alpha Sapphire, Water Shuriken was also one of Greninja's signature moves. However, Accelgor later gained access to Water Shuriken in Omega Ruby and Alpha Sapphire, albeit via Move Reminder. Greninja knows six official Pokémon moves, all of which it can legally learn in the Pokémon core series. In addition to Water Shuriken, Shadow Sneak, Hydro Pump, and Substitute, it uses Mat Block to initiate Secret Ninja Attack, and Double Team during one of its victory poses. Greninja's color palette of its official artwork and in-game appearance are slightly different. For its in-game appearance, its body and legs are a slightly darker shade of blue, while its webbings, face, and chest are cream instead of beige. Greninja and Lucario are the only Pokémon to not have a custom move that share a name with an actual Pokémon move. Greninja and Bayonetta are the only characters that can interrupt their own taunts. Greninja is also the third character in the series to have a taunt that inflicts damage, with the first being Luigi and the second being Snake. In Super Smash Bros. for Nintendo 3DS, the bottom screen marker tracks characters even during their teleporting moves. However, this does not apply to Greninja when it uses Shadow Sneak or Substitute. Despite being a partial Dark-type Pokémon, none of Greninja's attacks have the darkness effect. However, this is largely a result of the Dark type in Pokémon being associated with deception and underhanded fighting tactics (which is reflected in it being called the Evil type in Japanese), instead of literal darkness and shadows, which are characteristics associated with Ghost-type Pokémon instead. Coincidentally, its side special move, Shadow Sneak, is a Ghost-type attack. It is also a variation of Quick Attack in its home series, which is another move Greninja can learn naturally via level up. Greninja and Corrin are the only water-themed characters in SSB4. Greninja's forward smash when wielding a battering item is identical to its normal forward smash, albeit with the held item in lieu of its water katana. During Greninja's reveal trailer, several people mistakenly believed that Greninja was Mewtwo, despite the fact that Water Shuriken was clearly shown (with that being mistaken for Mewtwo's Shadow Ball). Although Mewtwo did eventually appear in SSB4 as a DLC character, at the time, the community had countless discussions about whether or not Mewtwo would be in the final roster. Due to being considered an exceptionally effective character at the time, Greninja was nerfed in update 1.0.4, and later had one of its beneficial glitches removed in update 1.0.5. These changes started the "Better Nerf Greninja" meme, where Greninja was photoshopped with Nerf products with the caption "Better Nerf Greninja". It was inspired by the similarly named "Better Nerf Irelia" meme from the League of Legends community, which was started under similar circumstances. Greninja's Smash 4 artwork looks very similar to its Pokémon X and Y artwork. Despite Greninja's tongue changing color when using its alternate costumes, the pink trail on its up tilt is retained. This page was last edited on February 19, 2019, at 21:05.